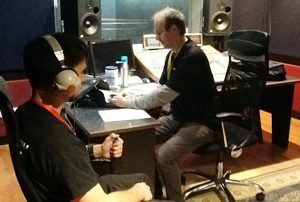 Jason Ridgway from Hearservice tests the hearing of an audio engineer. Another weekend jaunt led the HEARsmart team to the first ever Melbourne Audio Trade Show, held at SAE Creative Media Institute in South Melbourne. The show bought together big audio software and hardware manufacturers and sellers to show off their latest goods. We were delighted that it also had space for representatives from associated industries such as HEARsmart, Mute Audio, Music Victoria, Tom Larkin’s studio in the city and the Future Music Industry Network too. A great combination of talks and lectures and some pretty fantastic gear at the trade show ensured an enthusiastic crowd throughout the day. HEARsmart partnered with Hearservice again to get some additional audiology professionals on site, and by half way through the day our free hearing screenings were completely booked out. Next year we’ll bring more along to meet demand! The show coincided with the beginning of trimester for new SAE students and gave a great opportunity for the exhibitors to promote their educational pricing. It was also open to the public and completely free so anyone interested in the audio area could walk in.